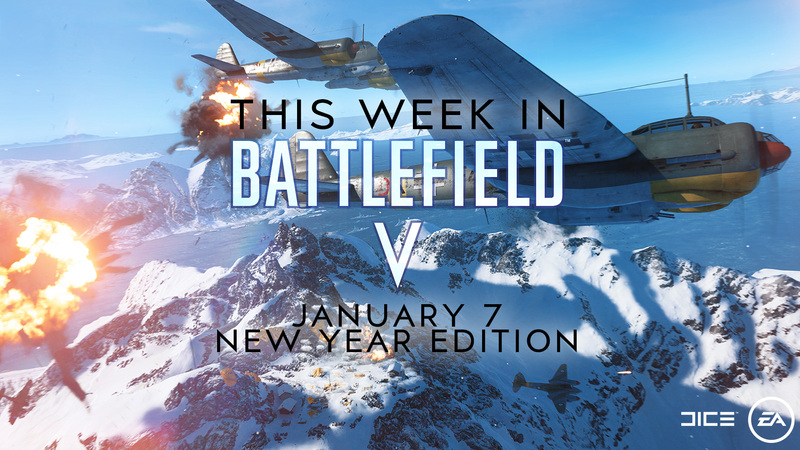 Welcome to the January 7th New Year edition of This Week in Battlefield V! We’re proud to have launched Battlefield V with you and are just as excited to embark on our journey throughout 2019 that will initially introduce two previously announced Tides of War chapters. Getting us all on the same page, friendly reminder that Chapter 2: Lightning Strikes kicks off here in January and lasts until March where we change gears and roll out Chapter 3: Trial by Fire. As we stoke up the fire, you’ll be learning more about Chapter 2: Lightning Strikes including new content, new challenges, the all-new Combined Arms co-op experience, two new game Modes, and more! Stick with us through any of Battlefield’s channels so you don’t miss a beat. In the meantime, below you’ll find a glimpse at what to expect this week within the Battlefield V community. As always, timing on the below can always shift. We’ll do our best to keep you updated of any changes. LIVE NOW Article – This Week in Battlefield V – The rundown of various news beats in a concise communication roadmap. This is the article you’re reading! LIVE NOW Article – Battlefield V’s Known Issues List Update (Reddit & Forums) – As we track known issues internally and acknowledge major issues brought to our attention we’ll keep our Known Issues list updated frequently. Weekly Community Highlight – Best Only in Battlefield Moment of the Week – Kicking off a new weekly beat, we want to take a moment to recognize killer in-game moments from the community, whether it’s an incredible long-distance headshot, a crazy action-hero multi-kill, or a gnarly plane stunt, for examples. Think you’ve got a winner? Send it our way on any of the Battlefield channels. Each weekly featured clip will be awarded a Best Community in the World Dog Tag! [DELAYED TO LATER IN THE MONTH] Monthly Community Highlight – Only in Battlefield Moments January Highlights – A collective of some of the best OIB moments we’ve come across from the community. Like the above, each clip author will receive a Best Community in the World Dog Tag. Teaser – Chapter 2: Lightning Strikes – That’s all we’re going to say for now. 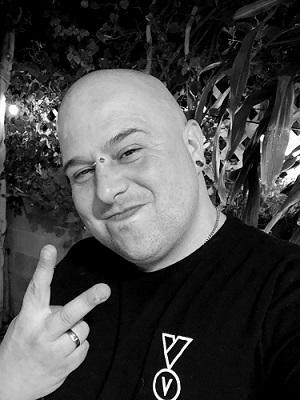 Article – Battlefield V Weekly Debrief - Your one-stop destination for all the blogs, videos, and major news that happened in the week, with a comprehensive Q&A with our DICE developers using feedback collected from the Battlefield Twitter, Reddit, Discord, and Forums. The 'Monthly Community Highlight – Only in Battlefield Moments January Highlights' has been delayed as we are still pulling together the montage video. More interested in the upcoming patch and what it's fixing, really. Can't wait to hear about that. Having the highest count is the only thing that matters. Coming in 1st place on my team with less kills than anybody in the top 10 is the ultimate feeling for me. Why is it so hard to just say “we know we dropped the ball on Company Coin and the fix is coming this patch”. Where are the Americans, Russians (Mosin Nagant)!! !, Japanese,French,and Italians? This. Address the issues, game is in terrible shape right now, nobody plays Medics, Recons are trash, Tanks are trash, SMGs are peashooters, can't even afford CC to upgrade a vehicle because I get almost none, bugs of all kinds all over the place. Bug fixes is all I care for right now. They will come through, they have in the past. I agree there are many bugs, but I’m still on every night and weekend. I may b*tch but I love it! Along with all of the core gameplay issues and underpowered weapons, largely decreasing or just eliminating lag compensation would benefit a majority of the players. It's 2019 and most people have access to a solid internet connection, so stop punishing those who do by giving the players with poor connection an unfair advantage. Most people have a good internet connection and some don't, that's life. Lag compensation is the equivalent of a participation trophy. Honestly, I tune in for a game and then leave. 8 map is pitiful for an AAA game. It's just so bloody boring half the time in these matches. Got some fun out of the game, but this game is so unfinished it is laughable it was even released. No one cares about all that reddit, highlights ****. Give as info about patch please. What about company coins XD will u guys fix this finally? what about planes, they need work (as well as getting spawn killed before take off on some maps) Also more vehicles in general. We appreciate the new content, but as stated already, patch notes would be highly preferred, and personally, I would like to hear what EA / Dice are doing about aimbots, ESP, and other cheating methods in multiplayer. There are literally tons of websites online offering unfair tools to cheat in this game, which is exceptionally frustrating. Thank you. Very nice 10 points for telling us about the patch👌 I cant believe this enymore, I think i hop into world of COD. I don't need new maps, new skins. 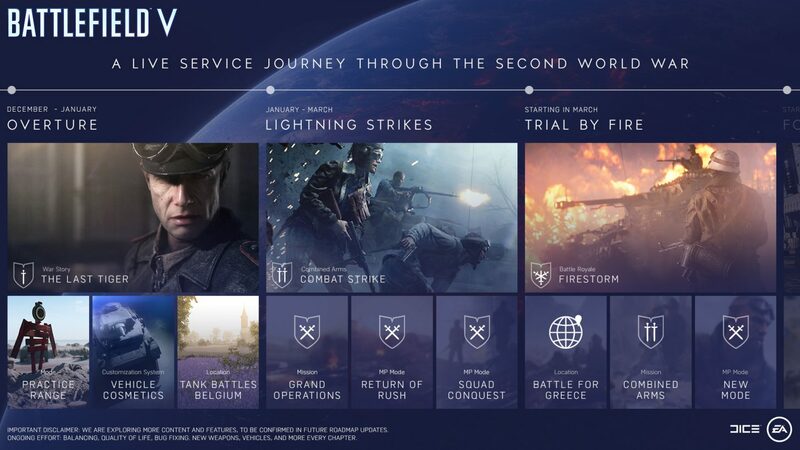 What I need is playing BF V 2 game in a row. Now i must Alt+F4 almost every game because new map stops loading. Nobody from EA/DICE don't care. Every game when I play allready starts and I lost many points every game. Company coins? I can't buy upgrade's for weapon. DO SOMETHING !!! Lol, nope. Trying to put players with higher pings onto a level playing field is not giving them a participation trophy, not even close. I would say it is the opposite- people on low pings would be at an unfair advantage and should be getting the participation trophy. A player with a 15ms ping is like getting a 10m head start in the 100m dash over a player with a 65ms ping. You are looking at it wrong. I am stuck on a 65ms ping as the closest server is in Sydney, on the other side of the country. I need my USSR They won the was for us, they deserve to come quickly. PATCH PLEASE for CC, TTD bug, visibility etc before anything else first and foremost. New content should come after all of this. Priorities seem wrong here.